Clifford, Eth. The King Who Was Different. Indianapolis. Bobbs-Merrill. 1969. Octavo. Decorated hard cover. First edition. Illustrated by Francoise Webb. Fine copy. Clifton, Lucille. Everett Anderson's Goodbye. New York. Henry Holt and Co. 1983. Octavo. Soft cover. Illustrated in color and black & white by Ann Grifalconi. Fine copy (owner name on end paper). Climo, Shirley & Ruth Heller. The Egyptian Cinderella. Inscribed by author and illustrator. Photo available. New York. Thomas Y. Crowell. 1989. Octavo. Hardcover. First edition. Full number line. Illustrated in black, white and color. 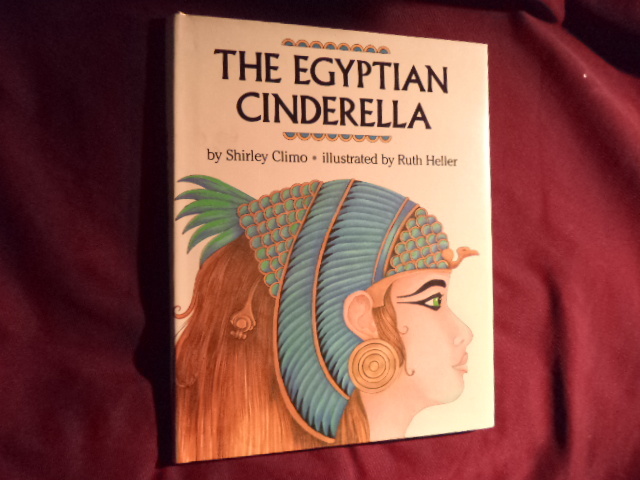 Inscribed by the author and illustrator "Especially for Lana - with thanks with love, Shirley Climo 2000 To Lana Ruth Heller". Fine copy in fine dust jacket (in mylar). Climo, Shirley. Stolen Thunder. A Norse Myth. New York. Clarion. 1994. 4to. Hard cover. First edition. Illustrated in black, white and color by Alexander Koshkin. Fine copy in fine dust jacket (in mylar). Clise, Michele Durkson. Ophelia's Bedtime Book. A Collection of Poems to Read and Share. New York. Viking Press. 1994. Octavo. Hard cover. First edition. Illustrated in black, white and color. Fine copy in fine dust jacket (in mylar). Clise, Michele. Ophelia's Voyage to Japan or The Mystery of the Doll Solved. New York. Clarkson N. Potter. 1986. Octavo. Hard cover. First edition. Illustrated in black, white and color. Fine copy (owner name) in fine dust jacket (in mylar). Clise, Michele. Ophelia's Voyage to Japan or The Mystery of the Doll Solved. Photo available. New York. Clarkson N. Potter. 1986. Octavo. Hard cover. First edition. Illustrated in black, white and color. Fine copy in fine dust jacket (in mylar). Clise, Michele. Ophelia's World or The Memoirs of a Parisian Shop Girl. New York. Clarkson N. Potter. 1984. Octavo. Hard cover. First edition. Illustrated in black, white and color. Fine copy (owner inscription) in fine dust jacket (in mylar). Clise, Michele. Ophelia's World or The Memoirs of a Parisian Shop Girl. New York. Clarkson N. Potter. 1984. Octavo. Hard cover. First edition. Illustrated in black, white and color. Fine copy in fine dust jacket (in mylar). Cloke, Rene. The Town Mouse and the Country Mouse. Photo available. New York. Exeter. 1983. 4to. Decorated hard cover. First edition. Illustrated in black, white and color. Fine copy (very light edge wear on spine). Coburn, Jewell Reinhart. Jouanah. A Hmong Cinderella. Photo available. Arcadia. Shen's Books. 1996. 4to. Hard cover. First edition. Illustrated in black, white and color by Anne Sibley O'Brien. Fine copy in fine dust jacket (in mylar). Cody, Tod. The Cowboy's Handbook. How to Become a Hero of the Wild West. London. Breslich & Foss. 1996. Octavo. Hard cover. First edition. Illustrated in black, white and color. Fine copy in fine dust jacket (in mylar). Cohen, Barbara. Robin Hood and Little John. New York. Philomel. 1995. Octavo. Hard cover. First edition. Illustrated in black, white and color by David Ray. Fine copy in fine dust jacket (in mylar). Cole, Joanna. Ms. Frizzle's Adventures. Ancient Egypt. New York. Scholastic Press. 2001. 4to. Hard cover. First edition. Illustrated in black, white and color by Bruce Degen. Fine copy in fine dust jacket (in mylar). Cole, Joanna. The Magic School Bus in the Time of the Dinosaurs. New York. Scholastic. 1994. Octavo. Decorated hard cover. First edition. Illustrated in color and black & white by Bruce Degen. Fine copy. Cole, Joanna. The Magic School Bus. Inside a Beehive. New York. Scholastic. 1996. Octavo. Decorated hard cover. First edition. Illustrated in color and black & white by Bruce Degen. Fine copy in fine dust jacket (in mylar). Coleman, Satis. Singing Time. Songs for Nursery & School. New York. John Day. nd. c. 1930. 4to. Decorated hard cover. First edition. Illustrated by Ruth Hambridge. Fine copy. Collard, Sneed B. Animal Dads. Photo available. Boston. Houghton Mifflin. 1997. Octavo. Hard cover. First edition. Illustrated in black, white and color by Steve Jenkins. Fine copy in fine dust jacket (in mylar). Collins, Kerigh. David Livingstone. Washington. Review and Herald. 1961. Octavo. Decorated hard cover. First edition. Illustrated in color and black & white by the author. Juvenile book. Near fine copy (very light shelf wear). Collins, Meghan. The Willow Maiden. New York. Dial Books. 1985. 39 pps. Octavo. Hardcover. First edition. Illustrated in color and black & white by Laszlo Gal. Fine copy in fine dust jacket (in mylar). Collins-Varni, H. Elizabeth. The Doll Lady. Bellevue. Illumination Arts. 2001. 4to. Hard cover. First edition. Illustrated in black, white and color by Judy Kuusisto. Fine copy in fine dust jacket (in mylar).